The bathroom seems to be the room that gets the messiest and is the hardest to clean. Well I am here to tell you that it may get messy, but it's not hard to clean. Less than 5 minutes a day will keep your bathroom sparkling and visitor ready all the time. Teach the kids (young and old) to hang up their towels and the bath mat when they are finished and to either put dirty laundry in the hamper or straight into the washing machine. It's amazing how these two simple things can make your bathroom look great. 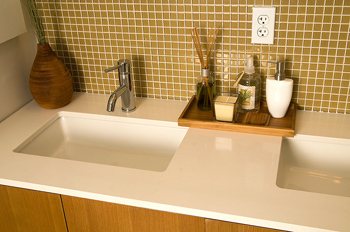 Want more ideas to keep your bathroom spotless? Read on! Keep a tub of baby wipes in the bathroom...swipe the benches, basin and taps each day. Not only handy for the baby's bottom...but they keep your bathroom smelling fresh and clean. "You can make your own baby wipes and save a fortune. In an ice-cream container mix 2 tablespoons baby bath/wash, 1 tablespoon olive oil and 2 cups water. You can use paper towel in this mix if you like. I used face washers I bought from The Warehouse, 10 for $5. I bought 3 packs, all white so I knew they were the wipes. Being white they were easy to soak and launder with the nappies." Wet a microfibre cloth and run it over your shower door, walls and floor. Not only does it remove the scum but it removes it easily. Sabco make a great microfibre bathroom mitt that sells for around $8.00 and you'll find it in the cleaning aisle of your supermarket. It will last for at least twelve months and save you a fortune on chemical cleaners. Cleaning grout can be done with a paste made from mixing bicarb soda and peroxide. Let sit on the grout for 30 minutes…scrub with a toothbrush. The toilet...not a pleasant task. Easy clean the bowl with a spray of vinegar and scrub with the toilet brush. If you have tough stains try a couple cups of vinegar allowed to sit a couple hours. This should help minimize scrubbing. Before you go away on holidays throw a couple of Steradent tablets into the toilet bowl to prevent staining while you're away. "My toilets have never been so clean. I tip the nappy soaker solution into the toilets after I've soaked the nappies and let it sit for a while. A quick brush and flush and they are sparkling clean and bright and I'm not wasting the solution in the nappy bucket either." Just a few tips....hope they help.